Belk.com/RoadSouthSweeps: Win The Belk Road South Sweeps 2016! The Belk Road South Sweeps is back in 2016! This year, Belk will be giving away a total of 909 Belk Gift Cards. Plus, over 100 lucky travelers on the Road South will win each month. Play the Belk The Road South Instant Win Game daily at Belk.com/RoadSouthSweeps and you could win in a snap. Belk will feature different Sweepstakes with incredible prizes and getaways throughout the year so come back here to learn what you could win next! Sign in or register now and hit the “PLAY NOW” button to see if you’re an instant winner. It’s that easy! Then, return every day through December 31, 2016 for another chance to win a $15 Belk gift card instantly! The Road South Instant Win Game is open only to legal residents of the fifty (50) United States and the District of Columbia who are at least eighteen (18) years old at the time of entry. Looking for more prizes? 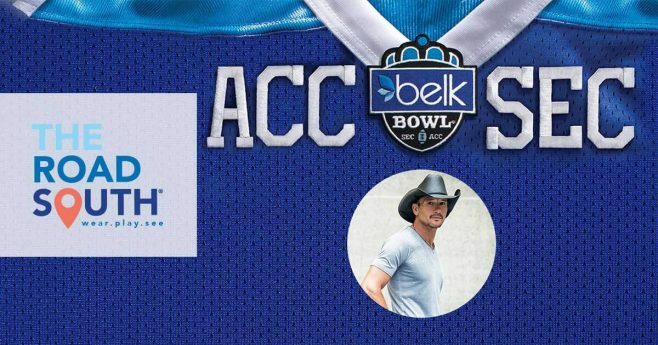 Enter The Road South – Belk Bowl Trip Sweepstakes and you could win a trip for two to Charlotte, NC including tickets for Belk Bowl. Enter daily through November 30, 2016. Grand Prize winner will be randomly selected on or around December 1, 2016. For more details, read the official rules. Starting on November 1st, you can also enter The Road South – Captiva Island Sweepstakes for a chance to win a trip for two to Captiva, FL (airfare, hotel accommodations and spending money included). Enter daily through November 30, 2016. Grand Prize winner will be randomly selected on or around December 1, 2016. For more details, read the official rules. Sweepstakes Entry: Earn one (1 ) sweepstakes entry per day for each current sweepstakes you enter. Instant Win Game Play: Earn one (1) game play per day by returning each day during the promotion period. Share on Facebook: Earn one (1) sweepstakes entry for each friend who register for the sweepstakes by using your shared link, up to one (1) per day. Share on Twitter: Earn one (1) sweepstakes entry each time you share the sweepstakes on Twitter per tweet, up to one (1) per day. Share via Email: Earn one (1) sweepstakes entry for each email you send, up to three (3) emails per day. Visit Belk’s Instagram Page: Earn one (1) sweepstakes entry by clicking the Belk Instagram button on this site, up to one (1) per day. Follow @Belk on Twitter: Earn one (1) sweepstakes entry by following @Belk on Twitter. Best Of 2016: Top Instant Win Games Of The Year! Belk.com/SantaBaby – Belk Santa Baby Sweepstakes: Ho, Ho, Win ! Hi I am so excited to enter I just do not have Twitter or Instagram but I do have a Facebook just letting you know. Have a great morning. I would love to win any of these give away it would be so exciting never win anything. Belks one of my favorite stores been shopping there for year . I love Biltmore Estates. It would be a dream come true to be able to win this trip for myself and my sister. Cross your fingers for us please. would LOVE SEEING THE BILTMORE IN THE SMOKELY MOUNTAINS.